The first novel released in June 2012, Reflections of Promises is the story of Patricia Allen-Coles. She has what most women desire...a loving and attentive husband, successful career, and beautiful home. But on the inside there is a different story being told. Domestic violence, extramarital affairs, and conception struggles plague the marriage. But there is another underlying secret haunting Patricia...one whose nightmare her husband has yet to uncover. "Reflections of Promises is a definite page turner. C. Michelle Ramsey does a great job of developing her characters and making you love them, hate them and even question their sanity. It was really nothing short of entertaining. I would recommend purchasing this book and look forward to C. Michelle Ramsey's next endeavor!" 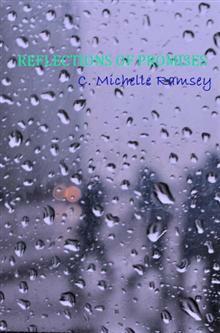 "Reflections of Promises vividly details how secrets and lies always find a way of catching up to you. The author lets you experience the emotions that the characters are feeling and allows you to go through the trials and tribulations with them. Patricia is a strong woman who has made a lot of difficult choices in her life. You immediately find yourself identifying with her and wanting to see her overcome her obstacles and find peace and happiness. difficult choices and learned to rise above them." Patricia laid her lime green Gucci bag on the table. Sitting her car keys next to the bag on the table in the foyer, Patricia began to riffle through the stack of letters that she had gotten out of the mailbox. The fourth letter drew her interest and immediate attention. Written in a rushed and somehow distantly familiar handwriting, was her name and address and at the top where the return address should have been it was blank. However, she saw that the postmark was from Atlanta. She never received any mail from Atlanta here at the house, it was always sent to her Post Office Box, so her curiosity was aroused. Tossing the other letters down next to her purse, she sat on the chair next to the table and slipped one Orange Opal manicured fingernail under the envelope’s seal to begin opening it. It’s been so long and I hate to disturb your new life, but there is a crisis at home and we can no longer manage without you. there. I tried to think of other alternatives, but you were my only choice. I hope this situation doesn’t bring you grief in your new life but we desperately need you here. Not more money, but we need you. I’m tired baby. towards him had done enough devastation. There was no way that they would endure under this new pressure. She would call Mama from a phone booth. Mama didn’t have her number and she didn’t know how she had gotten her address. Everything to do with home was sent to her P.O. Box that Jared didn’t know about. If she called home from the house or her cell phone, he would surely see it on the phone bills. He was under the illusion that she no longer had any ties to Atlanta after the death of her grandparents. Picking up her keys from the table, she stuffed the letter in her handbag and began heading out the door just as Jared pulled up. Oh God, not now, she thought to herself. He didn’t bother pulling into the garage but he parked in the driveway and climbed out of his Crème colored Mercedes CLK. Jared pulled his briefcase out of the trunk and came around the car. As he headed up the flagstone steps, Patricia tried to conjure up an excuse for where she was headed to. He gave her a brief look of curiosity as he passed her on the steps. “Umm…I need to run some errands real quick. I’ll be right back.” Jared grabbed her by the arm and turned her around back towards the house. Patricia’s whole body stiffened as she knew what was coming next. He slammed the door behind them. “Pat …where…are…you…going?” Jared asked in a stiff and controlled voice. "I told you…” was all that she could get out of her mouth before he backhanded her. She fell to the floor and he stepped over her body curled in a fetal position as he headed upstairs to the bedroom. She lay on the floor crying as she wondered where they had gone wrong. Patricia and Jared had met while she was in college. Patricia had attempted to start her life over after going to the University of Cincinnati on a full academic scholarship. Her high school grades had awarded her a full scholarship and she began to work as a stripper to have an income to live off during those hard years. The money that she got from her job dancing nights over in Kentucky, she brought an old BMW as soon as it was possible, and the most beautiful and what appeared to be expensive clothes that she could afford at the time from a consignment shop. That was when her alter identity began.